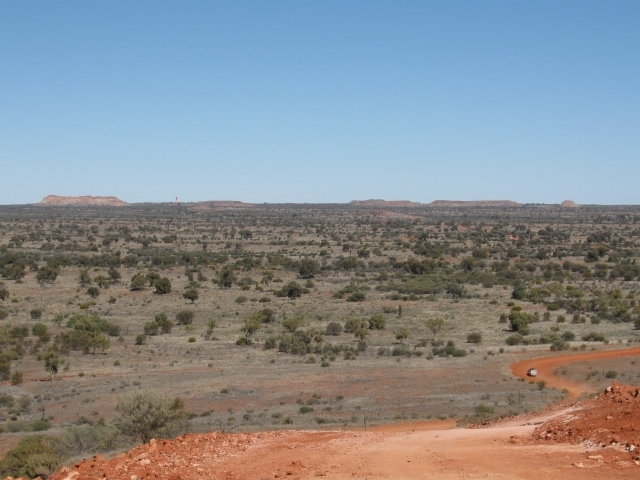 And here we are again, this time in the Red Centre. Or the Red Center for our American spellers. Or the "Red and Green" Centre this year because of all the rain. You will probably be familiar with images of this particular rock, just as all of us seem familiar with images of the Taj Mahal. Imposing and amazing to be here in person, even though we have been here once before (in 2004 my field diary tells me). So you get the archetypal photo from the Sunset viewing area. 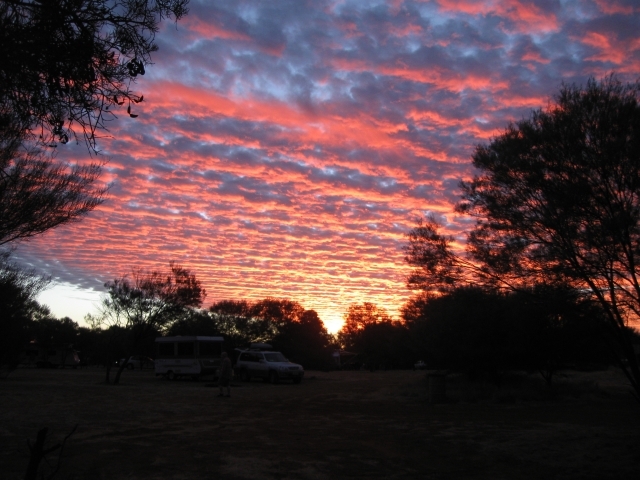 After a couple of nights at Gemtree we weren't quite ready to arrive in Alice Springs, so we postponed that by taking a lovely 4WD track South from Gemtree and then looping back West then East and camping in the East Macs at Trephena Gorge. It was bitterly cold that night so we went on to Alice the next day. And it rained for a few days. We got out between showers. Had a walk in the Olive Pink Botanic Gardens and had a looked down over the two contrasting culures using the same space but in very different ways. 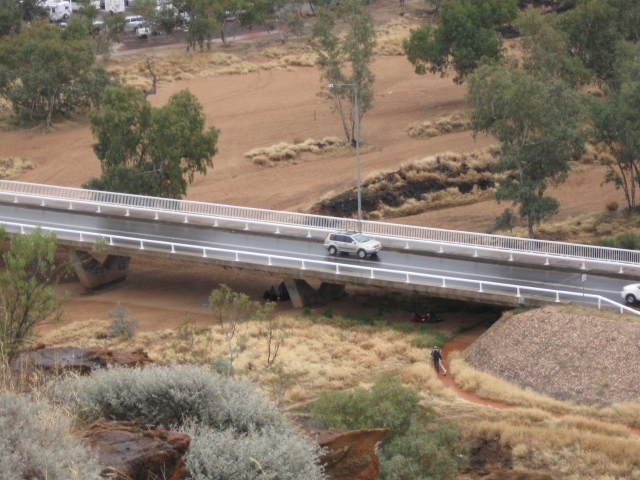 The modern bridge which supports a shiny 4WD also gives shelter to the Aboriginals with their fires to keep warm. After 3 nights at "The Lost Camel" we said goodbye to J&J who flew to Alice and other adventures, while we drove around to Kings Canyon. 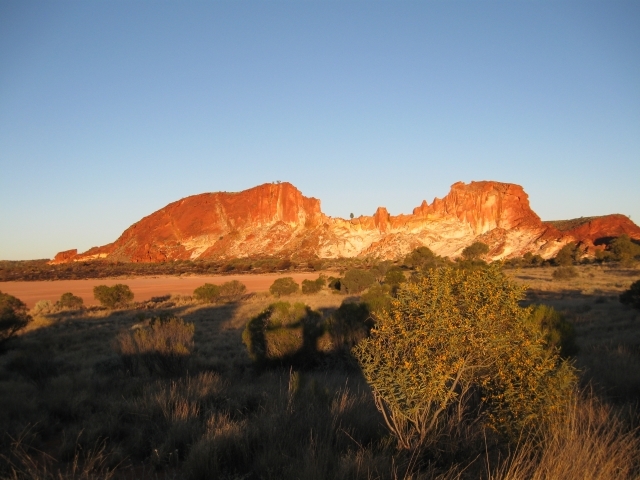 Yet another fascinating piece of geology, which combines aspects of the Bungle Bungles with aspects of Uluru with aspects of Kata Tjuta. Again there was water around, and flowering plants which spend a long time waiting between drinks! 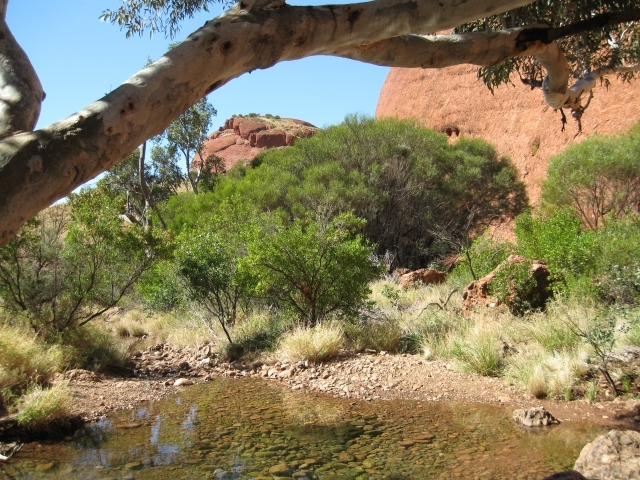 It does rain in the Red Centre, but the rainfall can vary between 100mm one year and 800 the next. Hugh variability and animals and plants ready to take full advantage of the occasional good year. 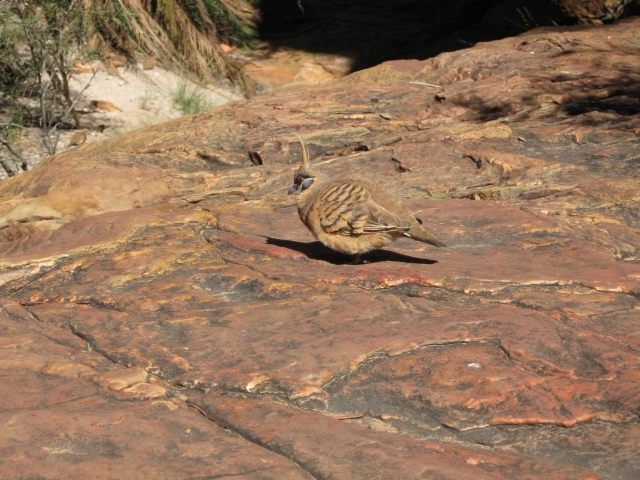 On the 8 km or so walk around the rim I came across a few very friendly Spinifex Pigeons where I decided to eat lunch. As soon as I sat down and pulled my food out of my pack several of these little guys flew over to see if there were crumbs to be had. They weren't agressive like many species can be if they are fed (Dingos being particularly bad but there are certainly some agressive birds with bad habits as well). They weren't afraid either. Just interested. And Spinifex Pigeons win the prize for best hairdo. Click on the pic to see it bigger. We moved on from Kings Canyon to a place we've been before: Rainbow Valley. But this time we got there via a new road: the Giles Track. Like the Plenty Highway it was a dirt road in pretty good condition. 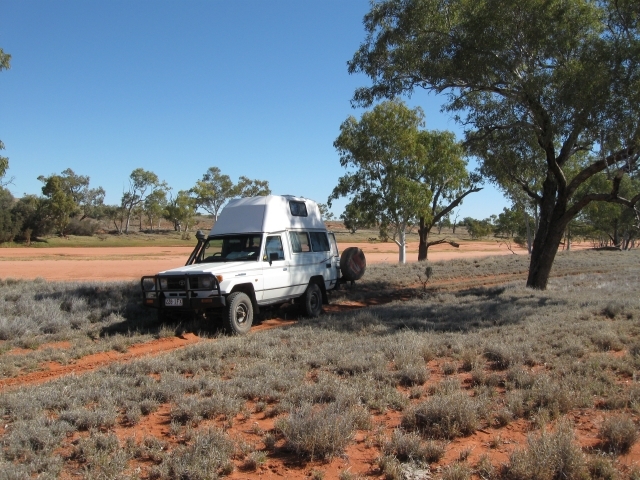 No so once you are on the last 24 Km 4WD track to Rainbow Valley itself. It is a horribly corrig-g-g-g-g-g-ated (you might know it was washboard) soft sand track with too much use and too little re-grading. Fortunately the valley looks like it does, and has camping for about 12 people. As with a lot of these places it is bring all your own water, but it does have a long drop toilet and that's all we need. Ah the simple life. A second good fortune is that we were briefed on a "secret" way out the back which avoids going back the 24 Km! The sign says "No Through Road" but around here we think that is just code for "This isn't on your map and we would rather not have you here but if you are in the know be our guest..."
So we did. Following the track was a bit uncertain at the outset because there were lots of equally "major" looking side tracks but these weren't large distances so we were prepared for some backtracking if it didn't work out. 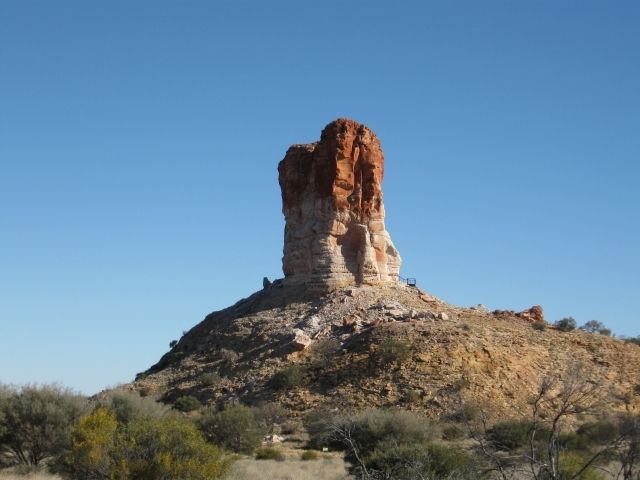 But it did, and brought us out half way along the Hugh Stockroute on the way to an Aboriginal community Maryvale, where you turn of onto another 4WD track to visit Chanbers Pillar. Here we are stopped for lunch on the Giles. A bit of shade from the Red River Gums and Bloodwoods by the Palmer river. No flowing water here, just a sandy bottom. But there is water some way down underneath. That's what keeps the Gum trees going. Once we got past Maryvale and on to the 4WD track the going was rough again for the 45 Km (maybe 1.5 hours travel time) to our destination. At one point we were amused to see that the track was taken right up and over a hill rather than around it as is usually the case. But when we got to the top we saw why. This is your first glimpse of Chambers Pillar. It is tiny but it is there. This was a first gear hill climb (although that still left another lot of low range gears, which is why it pays to have a "real" 4WD out here). You can see another car below us which passed us at the top while we were stopped to take a picture. The last 10 Km of the drive is across red sand dunes and the track is only one car wide, so you have to tiptoe along in case there is somebody coming up the dune the other way. A sign warns you at this point you should maybe have a very tall pole with a bright flag on it, but that's a little late if you didn't happen to bring one with you! There is timing issue the National Parks are famous for with a sign which says "No Dogs" once you get there...except that you may have just gone 200 Km over rough roads to get there! This time in our travels we saw a great response to this. Somebody had written "Now you tell me!" on the sign. But we had no dogs with us, and were just fine. As was the pillar. Now that you see the closer photo, you should be able to go back to the previous photo and to spot it. 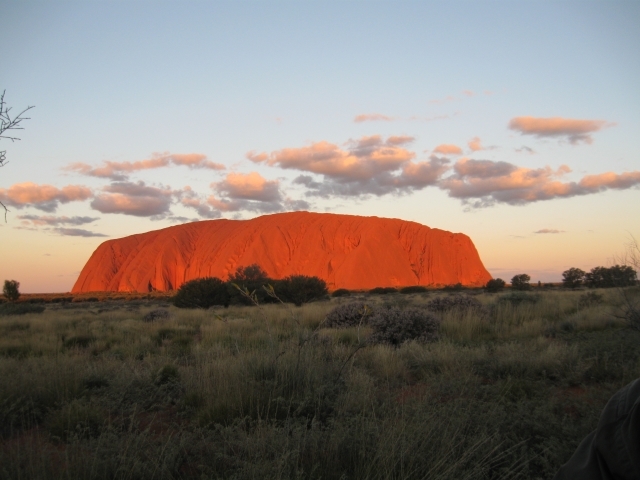 You can see why it was an important landmark for starting expeditions in the early days. We are still deciding where to go next. No change there! 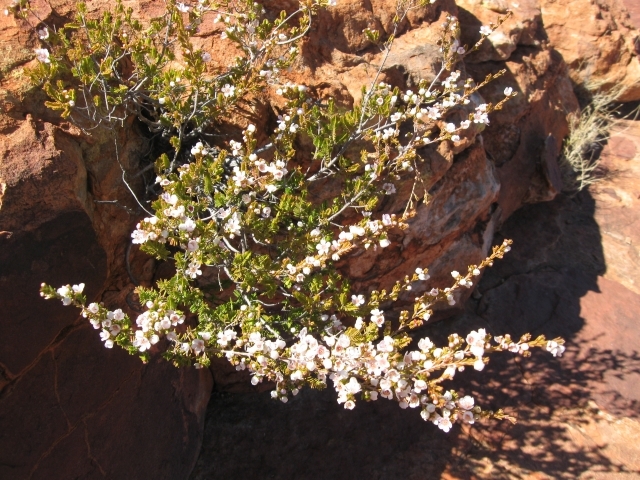 Today we're heading West (West MacDonnell ranges) again to Palm Canyon in the Finke Gorge National Park (just past Hermannsburg). Then the plan is to leave the Red Centre and head North to a few places we've enjoyed before.We are after warmer nights, but similar day temperatures to now. Not a combination which is easy to find. The days are delicious but we froze (literally) a few nights ago and our water we left outside was solid on top. Seriously bitter cold. The last two nights have been more reasonable (not warm, just reasonable).